When you choose Summerside Toyota, you’re connecting with a company that has the knowledge and the know-how to make sure its customers get the most out of their vehicle and services. With that in mind we’ve set up a fantastic Specials area to show off all the currently-available offers. You may just find exactly what you’re looking for here and a price that can’t be beat! 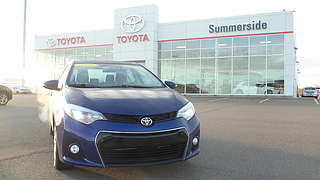 Come back often to see what offers Summerside Toyota has to offer you today. I bought a car here. Really nice place. They are very friendly and helpful when it comes to car shopping. In the process of hopefully getting my dream vehicle through them! i am super excited and can not wait! Said they would fill the car I bought up with gas. Only put a 1/3rd about $25 in the tank. No big deal just odd. Simply a great buying experience. Many thanks to Corey and Adam for not only meeting but exceeding my expectations. Well worth the drive. Efficient service. Very friendly staff. I am a loyal customer of Summerside Toyota. My 2014 lease was coming due, and they reached out to me with an amazing offer. Katharina, Lynn and Donna were a pleasure to work with - they went to work for me respecting my needs, wants, desires and budget. It was the best experience I have had and I sincerely appreciate the ease of doing business. I will remain a loyal customer and highly recommend Summerside Toyota. I had great experience to servicing my HighLander at Summerside Toyota few week ago, I was wondered by excellent customer's support provided by Jenny Richard (Service Advisor) and Nicole Jelley (Appointments Coordinator), their professionalism helped to resolve the difficult situation and left me satisfied with the service.